Quinney’s Bush is a popular, back-to-basics adventure camp set in spacious grounds of 10 ha with native trees and safe river swimming. Hosts Mark and Marama Quinney would like to welcome you to Quinney’s Bush, a camp which promotes memorable, traditional family holidays. Conveniently located 52 km from Nelson, 70 km from Murchison and 58 km from Motueka on SH6. Children’s program and go-karts run during peak season times. Water slide and large flying foxes open during December to February for a minimum of ten riders or by prior arrangement. Not all amusements may be available due to repairs, maintenance, bad weather or other factors outside of our control. Communal kitchen with cooktops, oven and microwave, communal toilets and showers, laundry and dump station. Hammocks, flying foxes, waterslide, amusements, confidence course, skatepark, BMX track, BBQs, campfires, internet access and shop for basic camping supplies. 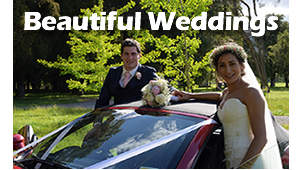 Consider having your wedding in the beautiful, natural surrounds of Quinney's Bush. Tariffs: Tent sites adult $18, child $10 (2-12 yrs), power site $46 (2 adults), cabin/caravan $70 (2 adults). Day visitor rate $5 per head Dec-Feb, $15 per vehicle Mar-Nov (max 5 occupants). Schools and other organised groups day visitor rate $7.50 per head (includes students and adults). We accept Visa, MasterCard, Eftpos. CampEasy rents out fully-equipped tents to create a camping holiday without the hassle and stress of setting up your own camping gear. Book a CampEasy tent and we'll make sure your tent is ready for you on arrival at Quinney's Bush. Click to let us know your details and the dates of your adventure at Quinney's Bush. Remember, please book each family separately even if you are camping together. Tariffs are subject to change and advance bookings will take this into account. We will confirm your booking via personal email from the office. I camped at Quinney’s with my family as a child and now we’ve been bringing our kids here since they were toddlers…. it’s the best part of summer and we love it. Even if we were offered a holiday in a hotel we would still prefer Quinney’s Bush! The best part about Quinney’s Bush camping are the flying fox and water slide every day – my kids can’t wait and spend hours on them. They also love taking their bikes – the BMX track is awesome and they do tricks on the skate park as well as ride all over the property. After a really busy year with three kids and two working parents we had the best holiday at Quinney’s Bush you could imagine. So relaxing with fun activities for the kids – we barely saw them and when we did they were smiling from ear to ear. We always meet up with our camping friends and meet new ones…. I look forward to it all year.